Ask most Utahns about Mexican beer, and you’ll get an answer about slices of lime and white-sandy beaches. But brewing in Mexico isn’t just a single fizzy, yellow note. Mexico is in tune with the craft beer phenomenon that has swept the globe, and brewers are using innovative ingredients and techniques local to their areas in a movement called cerveza artesanal. 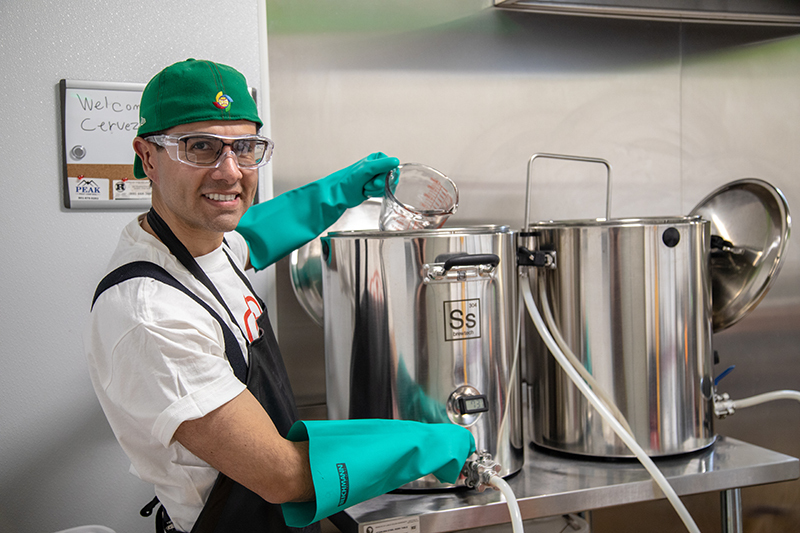 Javier Chávez Jr. is a Wasatch Front native who opened Utah’s smallest brewery in 2018, and he offers his unique approach at Cerveza Zólupez Beer Company in Ogden. SLUG: Give us a little background on yourself. Where did you grow up and go to school? Javier Chávez Jr.: I’m an Ogden-made, proud-to-be-born-and-raised Mexican-American. My folks are from Mexico, and I’m proud of that—I keep my heritage close to my heart. I went to the University of Utah then went to law school in Boston. I’m still an active lawyer and still have an active license. SLUG: What made you want to transition to making beer? Chávez: I practiced law in California, New York and St. Louis, and got a taste of the beer scenes in those places. I struggled to find a craft beer that paired well with Mexican food. My folks are in the restaurant industry, and I tried to make beer that would pair with those flavors. I always wanted to go into business, and I thought I could combine my passion for food, beer, my culture and my law background. SLUG: How did coming from the family behind Javier’s Mexican Restaurants influence you? Chávez: That’s a very important formative experience, being around food and beverage. Seeing people interact with food and beer led me to believe there was a huge space in craft beer for beers that are inspired by the same experiences as the food. Having grown up in the restaurant business, I knew what people like and don’t like for flavor combinations—I have a sense for people’s palates. We’re separate businesses, but there is a relationship there. I would love to sell these beers to other Mexican restaurants. Ever since I was little, I was bussing; I was a waiter; I put myself through college at the U as a waiter. People say, “Don’t get into the restaurant business—it’s hard,” and say, “Don’t get into the craft business—it’s hard.” But I felt prepared for that experience. SLUG: What is the concept for Cerveza Zólupez Beer Company? Chávez: We do what I call “authentically crafted cerveza artesanal” that’s inspired by my family’s Mexican traditions. Every one of our beers has a story to tell, and they’re written on the back of each bottle. It’s inspired by those experiences and the culture and the craft beers in Mexico. SLUG: What does the name Zólupez and your branding mean to you? Chávez: I wanted to create a name that had something personal to me, so I sat down one afternoon with a nice beer. It’s a combination of of my dad’s hometown in Mexico, Zóquite; my mom’s hometown, Guadalupe; and my last name, Chávez. So I combined those, and it’s special—it speaks about what I’m doing, my heritage, my family. My cousin is a graphic designer and a local artist. The logo encompasses different things from my childhood. My dad and brother played guitar, the charro hat (I would do the hat dance on Cinco de Mayo), the chiles, the cactus, the flowers. We sat down and figured out how to put it together—the artwork and the colors come from the heritage. SLUG: Do you you see yourself as participating in a brewing tradition, either new or old, from Mexico? Chávez: That’s one of our founding points, being inspired by cerveza artesanal, which is centered in Baja California and Monterrey, where Dos Equis is brewed right now. The Czech, German and Austrian immigrants from Europe started brewing in Mexico, and they brought their lager styles. But now you have people who want new options. People would go up to the States, going to San Diego and interacting with the local brewers there, working there, and bringing some of the knowhow and palate experiences back and pairing it with new stuff in Mexico, making it their own, using local ingredients and adjuncts. SLUG: How has the response to your beers been since opening in 2018? Chávez: I got a lot of advice on what I should brew, but I know what I like. The big fear was that it would be “Thanks, but no thanks.” But the high point has been the overwhelmingly positive response. Marketing and branding can only go so far, but the liquid has to be good. I’m humbled and honored that people have really liked what we’re doing. Not just locally in Ogden—people have driven from all over the Wasatch Front. I have not had to compromise my flavor. We yield five-gallon batches, giving 50 to 55 12-oz. bottles per batch. So it’s paradoxical—we constantly run out of beer, and I’m disappointed not being able to sell more! We have lines outside, but I have to limit it to one bottle a person. SLUG: Where does Cerveza Zólupez go from here? Chávez: Our next step is to jump up to a one-barrel brewhouse with some jacketed fermenting tanks. We can fill our sales room and have more beer at festivals. We want to go beyond the starter phase and brew more beer. We need to increase our immediate production now, but the vision is to have a larger brewhouse to produce as much beer as we can for people. We are actively looking at how to restructure this property, or to look at a new space from scratch. The beautiful thing of how I started is I get to learn from other brewers around me, learning best practices. SLUG: What is your favorite beer you make and why? Chávez: The Amber Ale brewed with piloncillo sugar and cinnamon sticks. It’s a multipurpose beer—it can go with everything. We have some serving suggestions on every bottle, but it’s got a nice balance of malt and hops, and you can pair it with any food. The other beers pair well, too, but I can have this beer anytime with any food, and it will always be awesome. SLUG: Do you have any major projects/collaborations/expansions on the horizon? Chávez: We’re trying to do a cross-border collaboration Mexican lager. So it’s a Zólupez recipe Mexican-style lager brewed by a Mexican craft brewery. I went to Mexico a couple months ago and pitched this idea, so we’re actively planning to brew a beer. I put on my lawyer hat and talked to the federal Tax and Trade Bureau and got my importer license, and talked to the Utah DABC. They said, “Make sure you have licenses, and we’re good with it.” To do a beer brewed in Mexico has been my dream. If you can’t find the perfect beer to pair with enchiladas, mole or your favorite tacos, make sure to visit Ogden to taste all these unique craft beers, including the amber ale, an IPA with agave nectar and lime peel, a stout with Mexican chocolate and three kinds of chiles, and a brand-new mango-and-coconut wheat beer. 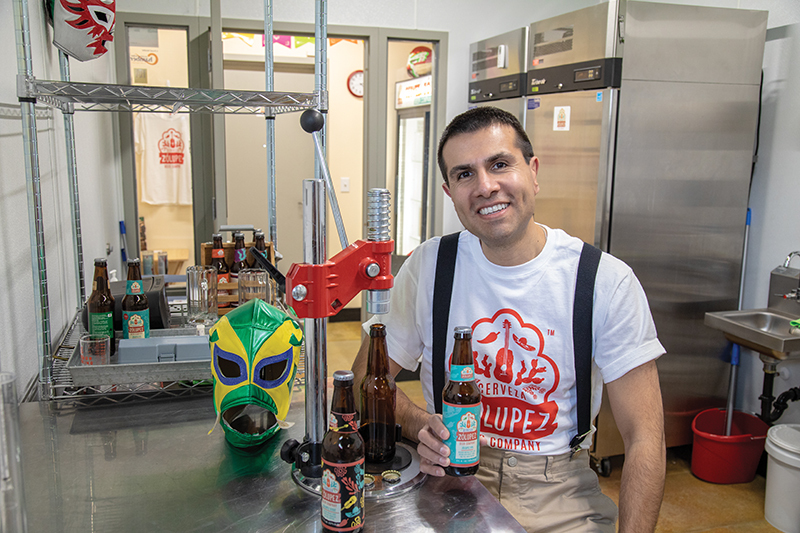 With Chávez’s batch size being so small, currently, you’ll want to follow Zólupez on social media @Zolupez on Instagram and Facebook, and @Zolupez_Cerveza on Twitter for notifications about when they are open to sell their extremely limited brews to the public. 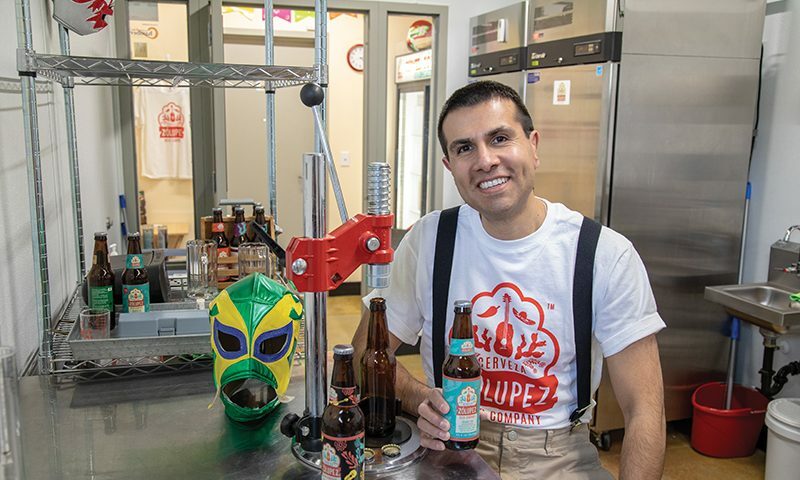 New beers are always in the works with ingredients like hibiscus, pineapple, lactose and more, so expect exciting ideas that continue to draw from Mexican heritage, and with enough support, you may be able to get cerveza artesanal all over Utah.